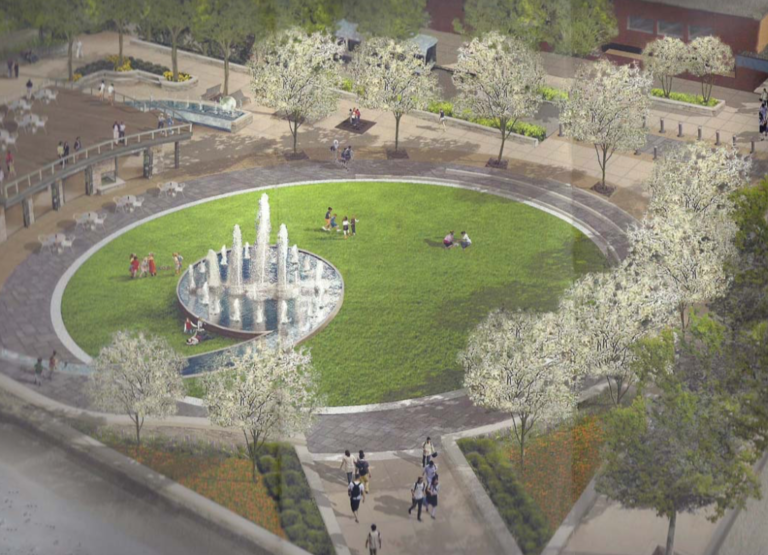 Earlier this month, Ann Arbor voters approved Proposal A, which would convert the old "Library Lot" in a new park and civic center. In this week's "Issues of the Environment," WEMU's David Fair talks to Will Hathaway, one of the leaders of the Ann Arbor Central Park Ballot Committee, about the potential, environmental impacts the new park grounds may have on the city. Proposal A, “to amend the city charter to ensure that the entire city-owned "Library Lot" property just north of the downtown library, between Fifth Avenue and Division Street, would become an urban park and civic center commons,” passed with 53% voting in support on November 6, 2018. Prior to this election cycle, the majority of the Ann Arbor City Council opposed this proposal. They preferred the site be developed, and in April 2017, authorized the sale of the property’s air rights to Core Spaces, a developer that planned a 17-story building to include retail space and a 12,000 square foot plaza. A portion of the proceeds of the sale would fund affordable housing. The issue of whether to develop this property has a long and complicated history. The Ann Arbor Committee for the Community Commons – overlapping with members of the Library Green Conservancy – collected signatures to put Proposal A on the ballot. [Will Hathaway and Alan Haber were the key players in both.] Then, a 6-5 majority of the Ann Arbor City Council voted to add "explanatory" text to the ballot, essentially arguing against the proposal. Supporters of the ballot proposal sued to remove the extra text, which was twice as long as the original proposal. After losing in local court, they prevailed at the Michigan Court of Appeals, and the extra text will not appear on the ballot. Separately, two city council members – Anne Bannister and Sumi Kailasapathy – have sued the city, Mayor Christopher Taylor, and City Clerk Jackie Beaudry, alleging that the city illegally executed a $10 million contract to sell the Library Lot development rights. That case is being litigated in Washtenaw County Circuit Court. Now, it is likely that a court will decide whether the “community commons” approved by voters or the large development will be built. The city charter currently states that the “Library Lot” cannot be sold and that the central park vision will move ahead. From an environmental standpoint, a park on top of a parking garage has drawbacks. It is unclear if the parking structure that occupies the property can support the development of a green space with trees on the top. On the other hand, some argue that a community green space in the center of downtown will be beneficial to the wellbeing of those who live downtown and provide a much needed respite from the city that currently does not exist. Will Hathaway, Alan Haber, and their allies who fought hard to get this proposal on the ballot have suggested several creative strategies for the vision of a central park going forward. One possibility is demolishing the current library and building a new library on the parking garage. The current footprint of the library would be used for the park. When Thanksgiving dinner is done and eaten, family and friends go home with leftovers. Still, it's likely you'll end up with food you have to throw away. It's food waste, and it's a problem. In this week's "Issues of the Environment," WEMU's David Fair talks to Washtenaw County solid waste specialist Noelle Bowman about the best ways to reduce food waste. Searching for new sources of natural fertilizer is an ongoing process, and a University of Michigan research project is exploring use of an unending source. In this week's "Issues of the Environment," WEMU's David Fair talks with U-M professor of civil and environmental engineering Dr. Nancy Love about the Urine Diversion Research Project. November Election 2018: Ann Arbor's Proposal A Passes-What Happens Next? Ann Arbor voters approved Proposal A on Tuesday. It requires the city-owned "Library Lot" be reserved for development of an urban park and civic center commons. Alan Haber is a member of the Ann Arbor Committee for Community Commons and helped lead the petition drive that put Proposal A on the ballot. Haber joined 89.1 WEMU's David Fair to discus the win and what comes next. WEMU's David Fair talks to Alan Haber about the passage of Ann Arbor's Proposal A.